Founded in 1946, COFCO is a Philadelphia-made company, and proud of its roots. COFCO provides clients with premier full service office furniture. They are the oldest continuously operating commercial office furniture dealership in the Philadelphia region. When operations expanded, they needed a new space to house their team. PIDC was able to help with financing in 2009, when COFCO made a long term commitment to their Philadelphia heritage by merging locations. With more than 125,000 square feet of warehouse space, and 24,000 square feet of finished office space and showroom, this innovative, rebuilt site located in the American Street corridor brought the COFCO team under one roof and centralized the office, warehouse and showroom into one full service operation. 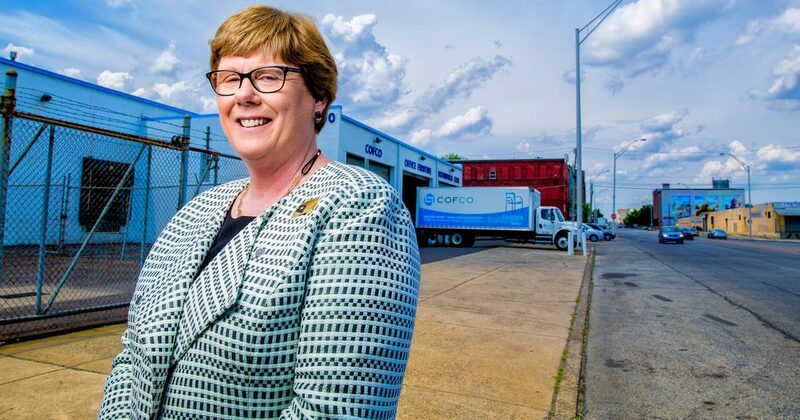 In 2016 COFCO transitioned leadership to CEO Joan Waters. This designation of Joan as majority shareholder officially makes COFCO a Woman Business Enterprise, a status that is very important to Joan and COFCO as an organization. Joan champions a new corporate vision which honors COFCO’s longstanding traditions and legacy and embraces the future and the dramatic changes that will occur in the way people work. PIDC is proud of COFCO’s growth and success on American Street. Some of COFCO’s Philadelphia-area clients include The University of Pennsylvania Health System, Burlington Stores, and Lockheed Martin. We look forward to more success for this fantastic Philadelphia business.